United Specialty Alloys uses fully automatic saws to help ensure accuracy and predictability when we are working on your Saw Cutting projects. This allows us to perform multiple cuts precisely and on schedule. Our facility also offers Bevel Cutting. We have adequate processing capacity at our 75,000 sq. ft. facility to keep your project on schedule and on budget. That means no headaches or surprises when it comes to the timeline you are expecting. United Specialty Alloys has industry-leading saws and machinery in its facility and our experienced team can help you choose the right automatic band saw and process for your needs. 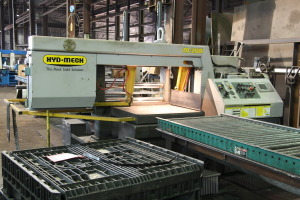 Ask about our Doall Saw with a 40″ x 40″ capacity or the Hyd-Mech production saw, with a 13″ x 18″ capacity for finer cuts. From bar and pipe to tube and metal, we are up to the task. If you’re not sure about whether Saw Cutting is right for your needs, or just don’t know which process is right, pick up the phone and give us a call. We are happy to answer questions and share our expertise to inform your decision.